The OECD area employment rate – the share of working-age people in jobs – increased by 0.2 percentage point in the fourth quarter of 2017, to 68.0%, and is now 3.6 percentage points above the trough of the fourth quarter of 2009. Across the OECD area, 563 million people were employed in the fourth quarter of 2017. In the euro area the employment rate rose by 0.3 percentage point (to 66.8%) in the fourth quarter of 2017, with the highest gains recorded in Estonia (up 1.4 percentage points, to 75.8%) and Finland (up 1.2 percentage points, to 71.0%). Outside the euro area, the employment rate increased by 0.4 percentage point in Canada (to 73.9%) and Turkey (to 52.3%), by 0.3 percentage point in Japan (to 75.7%) and the United Kingdom (to 74.4%) and by 0.1 percentage point in Mexico (to 61.1%) and the United States (to 70.3%). Compared with the same quarter a year ago, the OECD employment rate in the fourth quarter of 2017 was 0.8 percentage point higher, reflecting both falls in the unemployment rate and increases in the labour force participation rate. In the euro area, the employment rate was 1.1 percentage points higher than a year ago, mainly reflecting falling unemployment rates, especially in high-unemployment countries, such as Greece, Spain and Italy. 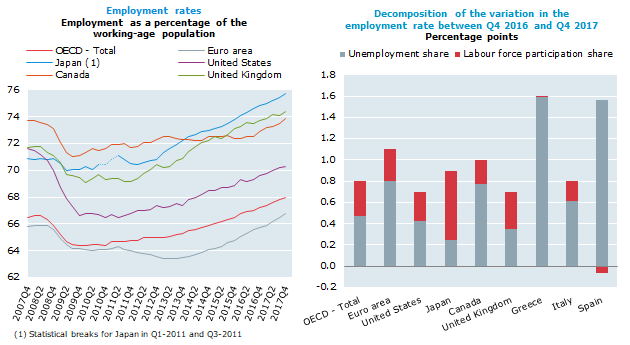 Outside the euro area, increases in the employment rate in Australia (up 1.2 percentage points, compared to the fourth quarter of 2016) and Japan (up 0.9 percentage point) reflected strong increases in the labour force participation rate, while the rise in the employment rate in Canada (up 1.0 percentage point) was mostly associated with falling unemployment. In New Zealand, and the United Kingdom, increases in employment rates reflected changes of broadly equal size in both unemployment and participation rates.